The holiday season is upon us with a few holidays already done and over for this year. The big ones are still coming, though. In the United States, the biggest of them all is that restless day after being cooped up for an entire day. Yes, I’m talking about black Friday, the traditional kick-off to the Christmas shopping season. I’ve gone through and found some pretty fantastic web pages done just for the holiday season. I skipped the pages just for black Friday because I wanted to focus more on the holiday season at large. So, these are examples of 10 well-done pages that are designed great to help shoppers find exactly what they’re looking for. Or, in some cases help shoppers find what they have no idea what they’re looking for which is my case every year. Websites that had a special page designed just for the holidays. It didn’t have to be a separate page from the homepage but it had to be just for the holidays. A few had their entire website taken over just for the holidays and that’s just fine. No links are included because many links will be dead after the holiday season. This page will be here longer than them. 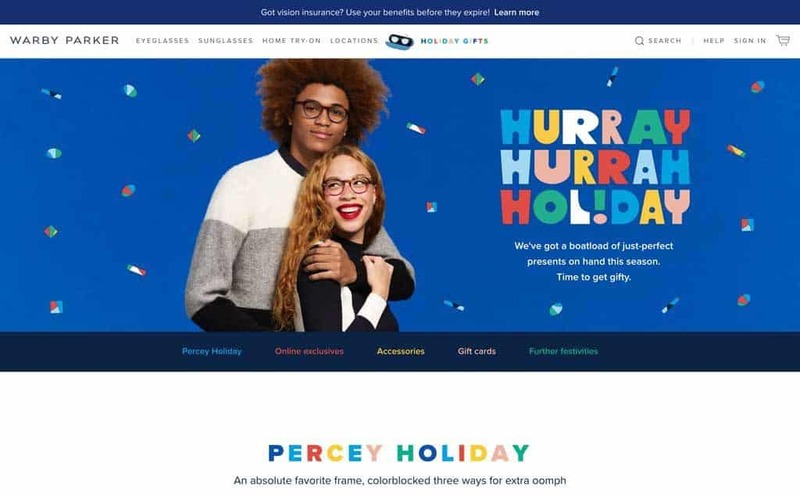 So without further ado, here are 10 holiday shopping website designs done right just for the holiday season. These aren’t ranked in any specific order. Because there are no links, I’ll do the best I can to describe what makes them so great for holiday shopping. Almost everybody shopping around the holidays has one thing in mind so why not just switch up your entire website? 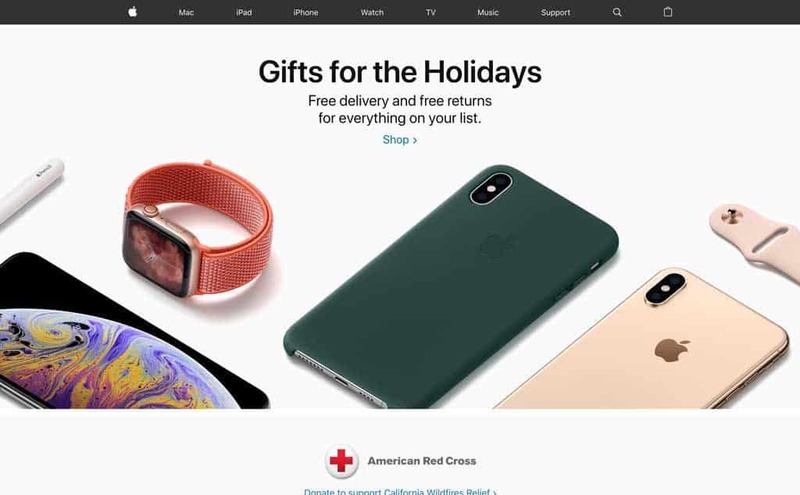 That’s what Apple did with a holiday specific homepage and all the specials that go along with it. There’s not much more to say than the simplicity of how to access the holiday page and the endless scroll of products and holiday specials is all out there in the open. 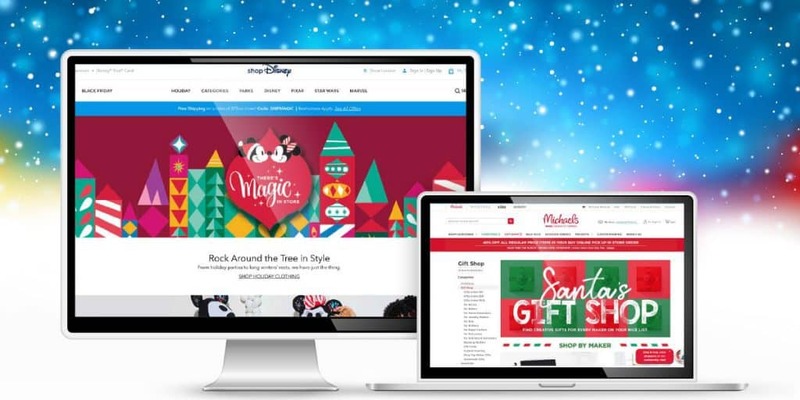 Whether you want to browse by category, price, or whatever the Disney Store makes it easy. 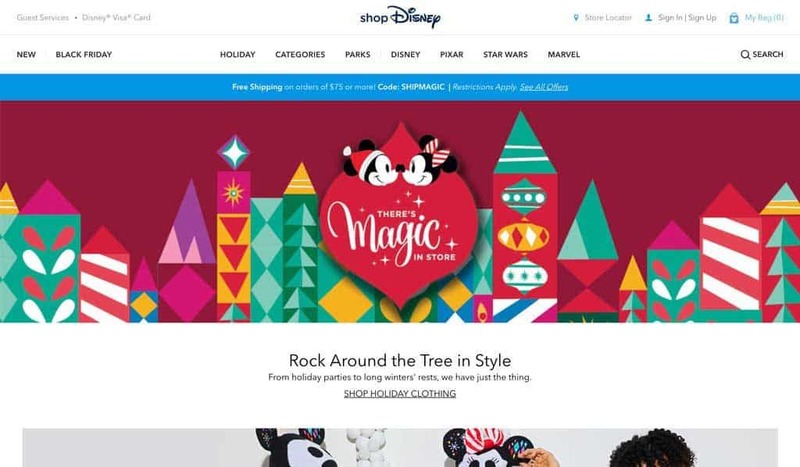 Right from the Disney Store homepage, you can access all the holiday shopping categories or the special holiday page. The Disney Store has pretty much figured out their audience down to how they shop and presented it in the perfect way. Not only does the page look great (very visual) but it loads fast and is well organized. I had to include the Disney Store because it’s a mall favorite around here for families with kids. Can you tell I have a kid (or maybe I am a kid)? Yes, free people did it up special with a fun gift shop. There are tons of ideas for gifts for everyone. The best part? They’re categorized in several different ways so you can browse how it best fits you. Are you shopping for a specific type of person? Maybe you’re on a budget? 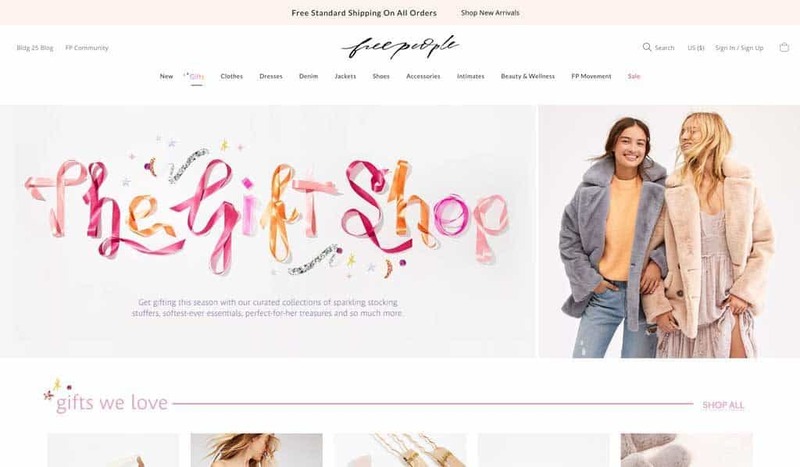 Whatever it may be, Free People did their holiday page in a way that makes it easy to find a gift for everyone. If you’re on their page around the holidays, they made it extremely easy to shop for the holidays. The good part about it is that by going with gifts in their navigation it’s a page that can be easily repurposed for any time of year. Other times of years it may be valentines day, easter, etc. When do I have to order it by to have it shipped in time? Can I pick it up in the store? Can I shop by category? 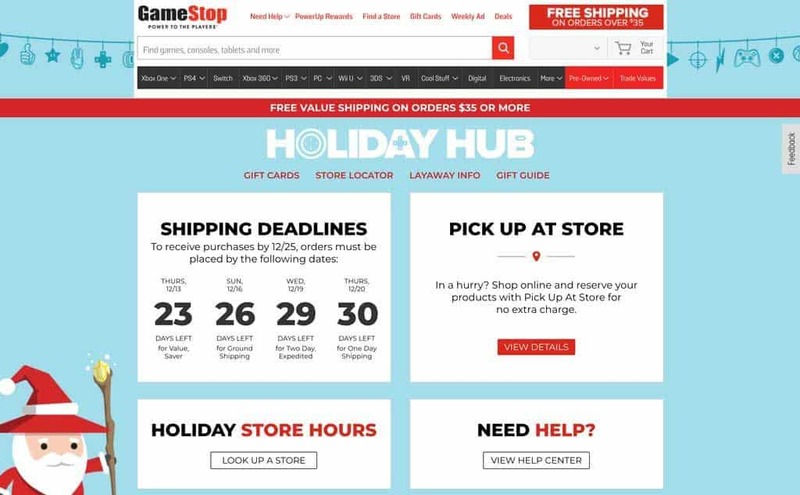 Yea, all those questions are answered in the GameStop holiday hub page. It’s one giant page with everything you could ever need to know about shopping GameStop during the holidays. It’s nice to see all holiday related information available all from one location. There’s nothing worse than added stress around the holidays. Isn’t it already stressful enough!? The gift guide is great too. There’s not so much about price targetted shopping (video games are all pretty expensive) but there are plenty of great categories. Everything is clearly laid out and easy to find for different interests. Are you more visual or just want to get to the point? I like to get to the point so those categories on the left are a blessing. Show me gifts under $25 and I’m good for that next work event. In case that’s not your preferred way to shop online, check out the right column which has all the goodies on display. You can scroll down the page and get unlimited ideas and see them in action. That’s essential for every retail website out there. Are you shopping for Christmas or are you just shopping for gifts in general? Michaels has a lot of items that have a specific Christmas theme which is they have a special page just for that. If you’re looking for a gift, though, they have you covered for that too with a convenient gift shop. There are those easy text links on the left if you want to get right to the point or the more visual shopping on the right. Pick their hobby and you’ll be flooded with lots of great ideas to gift friends, family, or maybe you’re in the holiday cheer to give a gift to a perfect stranger. 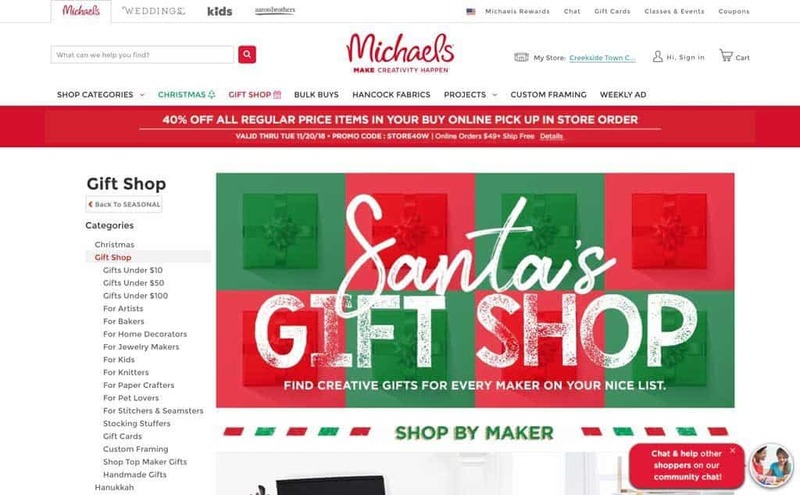 Whatever you want to find, Michaels has perfectly organized retail shopping online just for their audience. 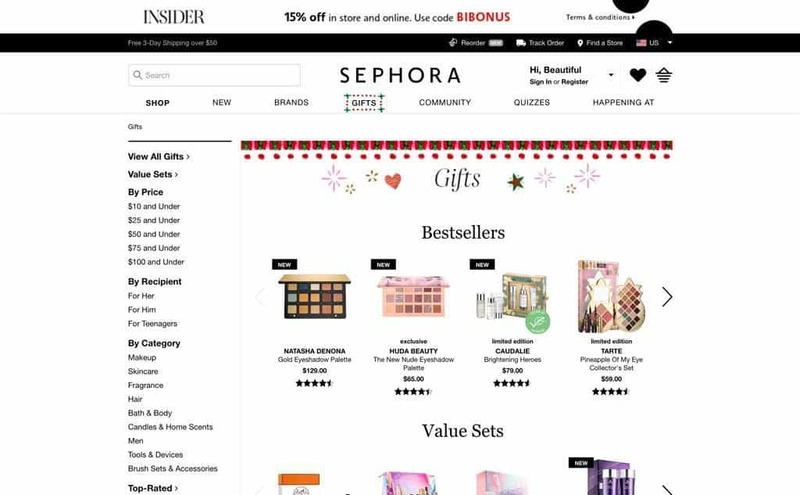 While I’m not a fan of cosmetics myself, Sephora’s gift page could even help me find something to gift someone. If I even knew a little about someone their website could help guide me. Since I would have no idea I’d head straight for the gift finder quiz or perhaps just the stocking stuffers page. Whoever I might be shopping for (my wife perhaps?) I might be able to find something she’d like. Sephora gives me, a complete stranger to makeup, a chance to buy the right thing for someone who I know likes makeup. All the holidays, all the deals, all in one place. 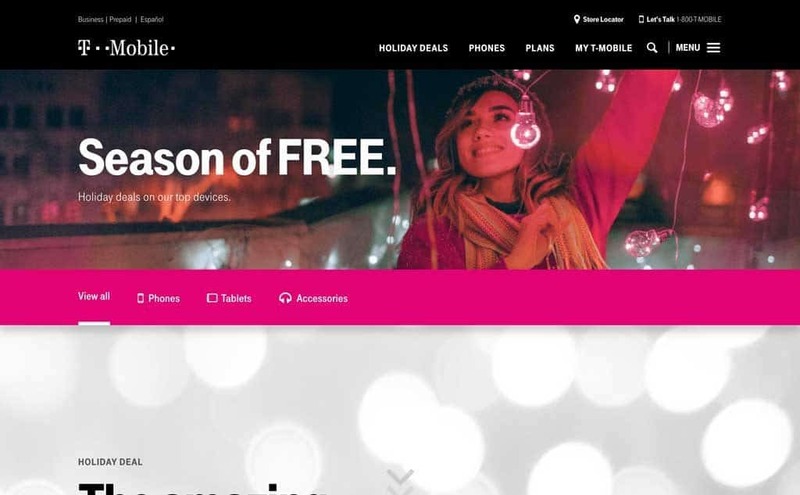 That’s what T-Mobile did with their holiday page. 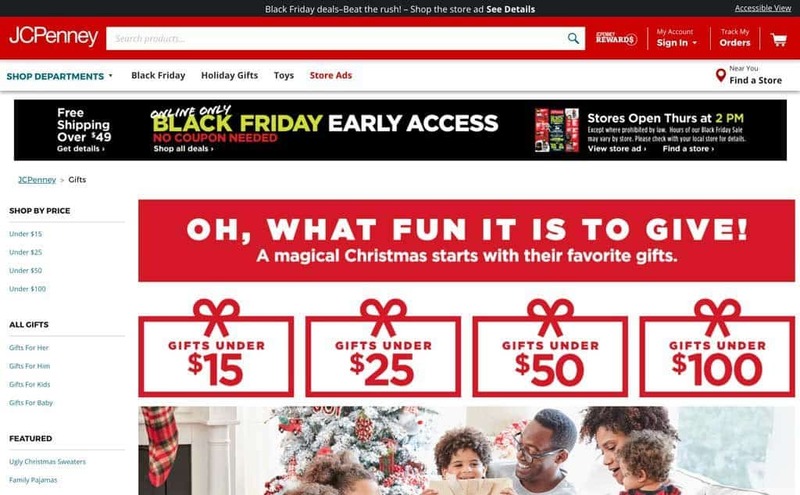 Right smack at the beginning of their navigation is a link to their holiday deals page. Absolutely everything they have on sale for the holidays. It doesn’t matter if you went there for phones, tablets, or accessories. I don’t really like to see everything, though, so you can choose just to see one category or the other. It’s as easy as pie to see only what you want and nothing more. Walmart offers a staggering number of products, especially with their recently ramped up battle with Amazon. What does that mean for consumers? How are we supposed to find anything!? Luckily Walmart did a pretty good job simplifying it on their gift guide. You can easily browse gift idea based on the category of interest, price, or the person. There are 3 major categories at the top which makes it easier to boil down the results and browse products that fit neatly into each category. Warby Parker will give you some art too to take away the pain of shopping! Yes, they partnered with a real artist to decorate for the holidays. They went all out on their special holiday gifts page that lays everything out neatly that you might want for holiday gift giving. I think with the level of personalization and individualism that glasses are, I might stick to the gift cards page. I don’t think my daughter would approve of my selection for her glasses. 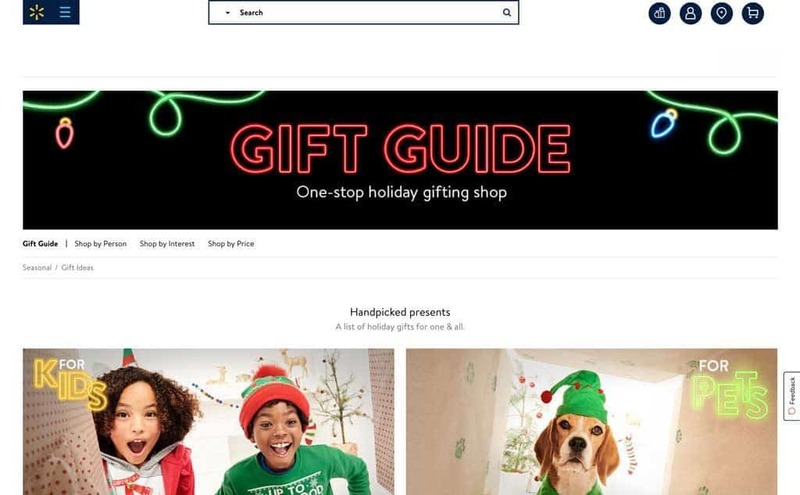 Have you seen any holiday shopping websites done differently than these examples which have synced well with the way you shop during the holidays? Just as the products people buy are all unique and different, holiday shopping preferences are all different too. I may not know how you prefer to shop online for the holidays but there is one thing I do know. What do I know? Websites are a vital part of every business and that’s especially true around the holidays. According to the master Google, 61% of shoppers would rather shop with brands which have a physical store. That’s great news for local businesses which can easily have a lock on local searches. That’s why we love helping local businesses take advantage of that with a professional custom affordable local optimized website.